My mom used to say ” Many hands make light work”. I remember she often said this when we would help her can the bushels of tomatoes that came from our garden at the end of the summer. When I had my own children I read if you don’t let your toddlers “help” you with chores around the house, they won’t want to when they are old enough to really help. So even though it always took longer to do chores with a toddler, I considered it an investment in the future. My future, that eventually they would be capable of helping with chores, and their future, that they would become productive adults that have learned that work is part of life. I know my kids heard “Many hands make light work” a lot growing up too. I always let them “help” with dishes and cleaning and of course canning too. When they were 7 and 10 we moved to a small farm. Then there was lots of opportunity to work together. We did a market garden and our young daughter did most of the planting without complaint. Now we have grandchildren, six so far! They are all becoming eager little helpers. 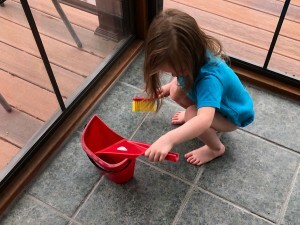 Now our Little Miss Number Five loves to sweep up bugs on our porch. It makes my heart glad to see our kids families carrying on the tradition of ” Many hands make light work”. Posted by Maryclaire Mayes on Tuesday, May 29th, 2018 at 04:44 and is filed under General.